Click each heading or scroll down to learn more. 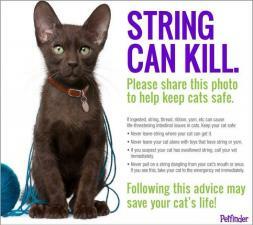 Also read What to do if your pet goes missing. Pets who have ingested possibly hazardous substances or human medicines require immediate attention within 30 minutes to induce vomiting before the toxin is absorbed. When in doubt, get it out. See some guidelines below. If a cat or any other self-grooming animal gets a poisonous substance on their coat, it is vital that you remove it as soon as you can. Household dishwashing liquid and warm water work best for most greasy substances like supermarket flea treatments, oils from garages and cars etc. Do it several times, then rinse. Cats like jumping in baths and exploring cupboards so bleach from bathroom cleaners or other household chemicals (even from paws) commonly cause deaths. Rapid, frequent rinsing is best. In all cases see your vet as soon as possible afterwards. For a good (but not complete and not Australian) list of plants poisonous to dogs or cats, view the list of toxic plants including photos at Toxic & non & toxic plants. 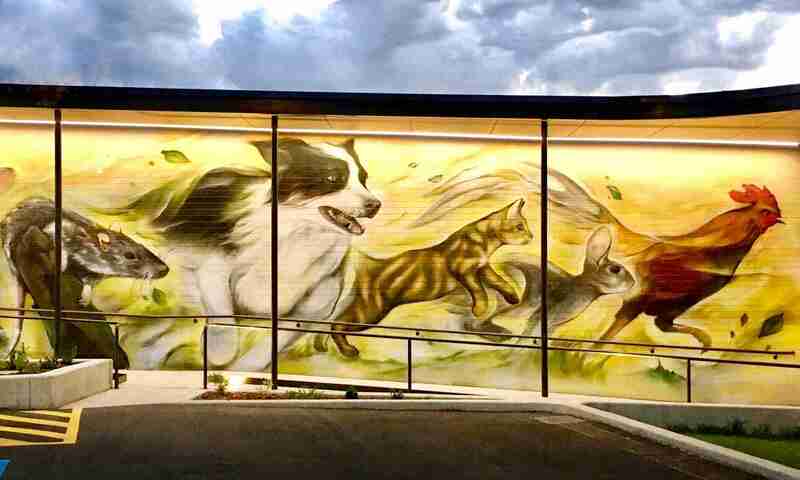 Read a list of the poisonings of dogs and cats in Adelaide here. Human medications, garden chemicals, rat baits, many human foods at Dangerous Foods for Pets also require immediate attention to avoid toxin absorption. It is a good idea to put your dogs outside if you take regular medication as they will pounce on any dropped pills before you can get to them. Also keep your meds on a high shelf, not a bedside table. Ibuprofen (e.g. Nurofen) is especially dangerous but all meds should be removed by a vet within minutes to avoid death. 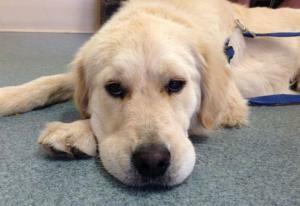 Bee stings in dogs cause surprisingly significant, severe and life-threatening reactions. Signs can include severe swelling, collapse, vomiting, or shock. Facial swelling (as seen below) is a good clue to the origin of the problem. Spider bite can cause similar signs and also require attention. Neither bees nor spiders should cause death if the dog is seen promptly. Emergencies are seen immediately. An intravenous dose of cortisone plus an antihistamine injection brings the problem under control quickly. This is Ebony. 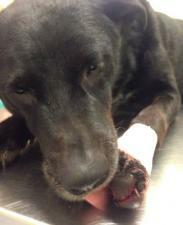 She cut her leg chasing the ball, severed two major arteries and nearly died of blood loss. If this happens to your dog or cat, immediately place a pad and bandage over the bleeding area just tight enough to stop the blood flow (pictured), and go straight to the vet. You can use a strip of torn fabric or even adhesive tape over a cloth pad. Don’t worry if the dressing seems too tight as it’s only there for the few minutes until you get to the vet, who will replace it or perform emergency surgery (as we did). That way they don’t lose too much blood on the way. If the bleeding can’t be bandaged (e.g. on the chest), applying firm direct pressure over the area with a cloth pad should slow the bleeding. Pets with fast or laboured breathing are in great danger. Make your way to a vet as soon as you can but avoid at all costs making your pet more stressed. If they panic, they will run out of oxygen and may die. Ring the vet on the way so they can get the be ready. The best thing is to know how to spot the problem as early as possible. All you have to do is measure the animal’s resting respiratory rate as it will be abnormal for some time before the crisis. It’s easy- when they are resting or asleep, count the number of breaths in 60 seconds. An abnormal number is 30 or above (i.e. greater than one breath every 2 seconds) and any animal breathing this fast should see the vet. If you can’t see the breathing, it usually means they are OK as animals with problems usually also have laboured breathing that’s easy to see. If your pet seems normal between episodes, look at these videos of reverse sneezing. If you even suspect that your pet has been hit by a car, go to the vet straight away even if they look fine. Serious internal injuries are common and easily missed. Read here about the typical internal injuries of cats after car accidents. Important: when handling animals who have been injured on the road, be extremely careful. Dogs and cats in pain often inflict nasty injuries on good samaritans. A good idea is to pick them up in a blanket or similar. First: calmly assess the situation. Just because they seem to be having trouble does not mean they are choking. Kennel cough for example looks just like choking. DO NOT try to force your hands into the mouth unless you know there is an obstruction: you will get badly bitten in the panic, and it will probably make the situation worse. If you can, lift the lip and look at the gum colour. If it is bright pink, that is a good sign. Ring the vet and make your way there but there is no need to worry if the gums remain pink and your pet is alert and conscious. If the gums are blue, there is probably little time to waste. You need to get to the vet as fast as you can safely do so. 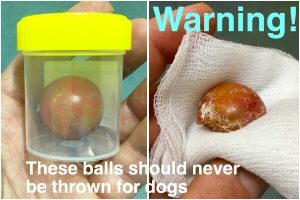 If possible, check the mouth and throat for foreign material such as a ball, toy, bone fragment and pull it out. Be aware that this could cause you to get a nasty bite from your panicked pet but it may also save their life. Do not waste too much time doing this if not immediately successful. The breathing problems might not be caused by an obstruction at all. If your pet is unconscious, hook your index finger and sweep it down over the base of the tongue feeling for loose foreign material you can hook out. If there is no breathing you can hold the mouth shut and blow into the nose. The first 6 to 8 hours are critical. This is the ‘golden period’ when fresh cuts can often be simply stitched back together under light sedation. Older wounds require an anaesthetic for debridement (removal of the infected layer) before stitching. If you have any doubt about whether a wound needs stitches, make an appointment straight away. We’d rather do a stitch-up in the evening than have a more complicated task the next day. Read more here about what to do if your dog or cat gets a cut. When dogs bite, the teeth create punctures and then the skin moves with the jaw as it closes. This means the surface wounds look small, whereas there is usually a large amount of tearing and damage under the skin. If your dog is involved in a dog fight, especially if the other dog was larger, you should visit the vet within six hours. This is the ‘golden period’ before infection sets in to the damaged tissue. The picture opposite shows a victim of a single quick dog bite after surgery to place drains. Before the hair was clipped there did no appear to be any wounds. 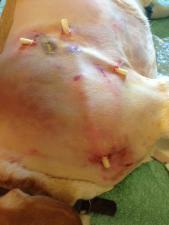 As you can see, the drains show the extent of the separation of the skin from the body. Without urgent treatment, this area would probably have suffered from necrosis and gangrene. 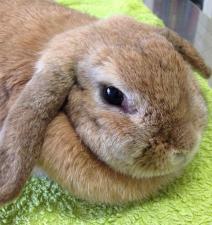 The rabbit pictured lives free ranging in a yard, and was noted to be quieter than usual. Thankfully the owner brought her to us. We suspected a fox attack and took xrays, which showed lung punctures, fractures, and a severe chest infection. She survived- can you believe how sick she is in the picture? Two lessons need to be learnt here: always protect your small pets and chickens from fox attack in a secure enclosure, and don’t expect it to be obvious if your pet is dying. 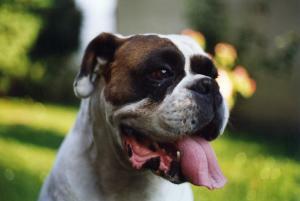 Read much more about treatment and prevention of heat stroke in dogs here. broken or chewed fragments of toys. For any of these, the symptoms will usually be vomiting, no interest in food and lethargy. If you suspect your dog, ferret or cat has eaten any of these items, contact the vet immediately. Sometimes we can induce vomiting if it is still in the stomach but we may need to rehydrate, stabilise and operate if it is lodged in the intestines. From October through to late summer huge quantities of the grass seeds pictured are released into the parks, yards and streets around Adelaide. During this time we advise you check your dog’s feet between the toes every day. 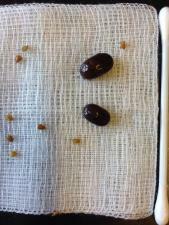 Once the seeds migrate under the skin they cause a painful weeping sore, usually between the toes. If this happens, contact us immediately and do not feed your dog in anticipation of an anaesthetic for removal. Watch the videos and click here to learn more about grass seed removal. First, IS it a seizure? Most have some muscle activity and a change in the level of consciousness. If it is a collapse without muscle activity, it may be fainting or syncope. If there is no change in consciousness, it may be a neuromuscular disease instead. Read more about seizures in dogs here. Dogs & cats bitten by a snake require immediate attention and antivenom to survive. 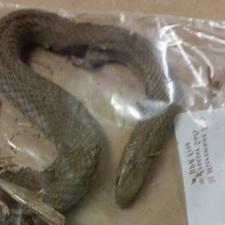 If you see your pet with a snake, go straight to the nearest vet; do not wait until symptoms develop. On your way to the vet, if the bite was on a limb, apply a compressive bandage to the limb to slow down the absorption of toxin. Prevention: keep dogs leashed or fenced when in areas where snakes may occur. Clean up rubbish and other ground cover and control mouse and rat populations to reduce the attractiveness of the area to snakes. Cats will seek out snakes so should be confined in these areas. A male cat straining repeatedly to pass urine is a true emergency, and should not delay in being taken to the vet. These cats are often mistaken for having constipation, whereas they usually have an obstruction of the urinary tract and are in serious danger due to the buildup of toxins in the blood stream.